Foundation is the base for your makeup and getting its application right means your half work is done. 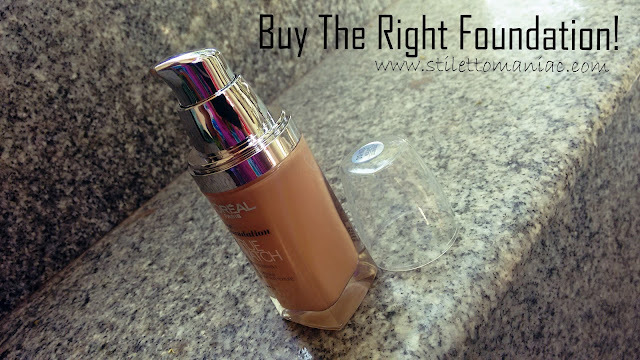 For a foundation to look flawless and natural you need to use the right one . Today there are a variety of foundations with different formulas, finishes, coverage and shades available and getting the right one which suits your skin shade and type can get tricky. These fantastic tips will help you shop for a foundation which is your perfect match. Foundations come in a variety of formulas and textures. There are gel based, liquid, cream, powder and even mousse foundations. If you have dry skin liquid foundation works best and oily skin beauties should try gel or mousse foundations. If you have oily even toned skin you just need light coverage so you can go for powder compact foundation which will help absorb excess oils. For combination skin you may need to use different formulas for different seasons. If your skin is sensitive then you should go in for mineral based foundation. I have combination skin and I mostly use BB creams. when I do use foundation I go in for liquid ones and dab a layer of powder compact to balance out things. Decide on the coverage you want: Before buying a foundation you need to decide on what kind of coverage you are aiming for . The coverage you want can depend on factors like when you want to wear a foundation and how uneven your complexion is. If you plan to buy a daily wear foundation you may want just sheer coverage but if you are looking to use your foundation for events or wedding you should go for foundation which gives high coverage. Same way if your skin just has minor blemishes you don't need heavy coverage but if you have prominent dark spots you will need a foundation which gives medium or full coverage. * Test the foundation on your jawline not at the back of your hand because have you ever seen a person whose back of hand and face has similar shade? * If two foundation shades look similar and you can't decide which suits you more then try one on left and one on right jawline. *Take a sibling or friend along when foundation shopping, they will tell you if the foundation looks natural or not . Don't trust the sales assistant or even a mirror. *Most foundations take time to blend in show their true color on your face, so wait for 15 minutes after tester application. Also some foundations can react with skin turning orange or give you instant breakouts, so definitely wait and see the results. * Test foundation on moisturized make up free face to know its true colour. If possible go foundation shopping without wearing any make up or just ask the SA to give you make up remover to remove make up from jaw line . *If you can't find a foundation close to your skin shade from a make up range try a different brand. I think it is best for Indian beauties to start of with lakme as they have shades closest to Indian skin tones. * click photos with the foundation on to check if it photographs well. Foundations with SPF reflect light so you should avoid foundations with SPF if you are selfie addict. I hope these tips help you buy the right foundation.